The following is part one of the story of several families who emigrated from Asch, a small city and district in Austria’s Bohemian region, to Pulaski County before the Civil War. The emigration started when two single men from Asch fled Austria after the failure of the 1848 revolution. These two men – John Adam Reichardt and John Christopher Geyer -- were the first members of their families to make their homes in Pulaski County. Others followed. In all, three Geyer families, one large Reichardt family, and one Penzel family, plus Wolfgang Wunderlich, a single man from Asch, settled in Pulaski County from 1850 to 1854. In all, by 1857, at least 28 emigrants from Asch had moved to Pulaski County (although two had moved away by that time). This group contributed to a sizeable increase in the number of Germanic emigrants in the county that, according to the 1850 census, numbered only about 136 men, women, and children. The emigrants from Asch spent the years before the Civil War adjusting to their new home. Some were farmers living in rural Pulaski County and others found jobs in Little Rock. Wherever they were living, they got caught up in the War and the families, like the rest of the nation, had divided loyalties: a few Asch emigrants or their spouses served in the Union Army; more of them were in the Confederate Army. Of all the Asch emigrants, Charles Penzel, a private in the Southern army, was most affected by the war: he was twice wounded, once severely, and he spent the last year of the war as a prisoner. Part one of the story of the families from Asch ends as the Civil War was coming to a close. The violent and tumultuous times must have been discouraging for them. However, their fortunes were about to change. As will be discussed in part two of this story, when the war ended, the families from Asch prospered, mainly as merchants, and they, along with their spouses, their children, and their children’s spouses, became the core of the city’s small, but influential, protestant – mainly Lutheran -- German immigrant community that for three decades had an outsized impact on Little Rock’s economic development, social life, and local government. The Johann Michael and Sophie Marie [Ludwig] Geyer family. Johann Michael (1790 – 1856) and Sophie Marie (1791 – 1873) and three of their children emigrated to Pulaski County. Their oldest son, John Christopher Geyer (1819 – 1878), was the first of the family to arrive. Like John Adam Reichardt, he left Asch after the collapse in Austria of the 1848 revolution during which he had “led a company of revolutionists.” After a short stay in Philadelphia, he traveled in 1849 to central Arkansas, where he lived briefly in Pulaski County before he bought land along the Arkansas River in Conway County, a few miles southeast of Lewisburg.7 Johann Michael and Sophie Marie followed their son to central Arkansas in 1852, departing from Bremen on the Rebecca, arriving in New Orleans on October 26, then continuing to Little Rock. With them came their son John Erhardt (1832 – 1919), and daughter Sophia (1836 – 1916). The family traveled in relative luxury, occupying a cabin on the ship’s deck.8 Johann Michael had worked as a butcher in Asch. The Johann Michael (Papa) and Anna Margaretha Geyer family. Also aboard the Rebecca in October 1852 was the Johann Michael (1811 – 1892) and Anna Margaretha (1810 – 1876) family. However, this Geyer family had a less comfortable trip across the Atlantic, traveling in steerage. In addition to the parents, other family members aboard the ship were their son John Christian (1845 – 1930) and four daughters, Anna Margartha (1841 – 1870), Ernestine (1838 – 1934), Alvina (1847 – 1927), and Emilie (1850 – 1926). Johann Michael had been a farmer in Asch. In his later years, this Johann Michael became widely known in Little Rock as “Papa Geyer,” the owner of a popular beer garden near the Arsenal, and I will refer to him by that name to differentiate him from the older Johann Michael Geyer. Although the two Johann Michael Geyer families were certainly kin to each other, evidence supports the conclusion that the older Johann Michael was not the father of the younger Johann Michael. For one thing, the younger Johann Michael was born in 1811, but the older Johann Michael did not marry until 1818. Also, none of the obituaries of the members of either family suggested a close kinship between the two families. Likely, the older Johann Michael was the uncle of the younger one or the two men were cousins. Isaac Geyer and his son George. Isaac (1814 - 1887) and George (1836 - 1880) traveled together from Asch to the United States in 1853. They crossed the Atlantic Ocean, departing from Bremen, on the Heinrich von Gagern, a ship that landed in New Orleans on October 12th.9 The two men were likely related by kinship to the two other Geyer families that settled in Pulaski County, but the nature of the kinship is unclear. Both men were farmers. 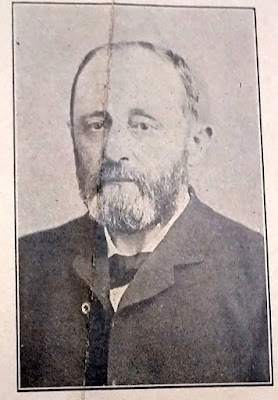 The single person who emigrated from Asch during this time was Wolfgang Wunderlich (1834 – 1901), who was unmarried when he traveled to the United States in 1852. His trip from Bremen to New Orleans was taken with George Reichardt on the Columbia, arriving on May 19th. In 1857, he would later marry Louisa Reichardt, George’s sister. Although the only documented relationships among the members of the families from Asch were the marriage of Christopher Reichardt and Ann Katherina Penzel followed by the marriage of Louise Reichardt and Wolfgang Wunderlich, other kinship relations – close and distance – undoubtedly existed. They were inevitable: the Geyer, Penzel, Kuenzel, Ludwig, and Wunderlich families had deep roots in the Asch area, and intermarriages between families with those surnames had taken place for more than a century.16 Whatever their kinships, the families certainly knew each other before they came to the United States, and their emigration to the Pulaski County suggests they had either agreed to emigrate to the same area or were mutually influenced to settle near each other. If nothing else, they probably found comfort in having people they knew living near them as that adapted to their new situation. Whatever reason they had for emigrating to a place with so few German-speaking residents, once in central Arkansas, Reichardt and Geyer probably wrote letters home that encouraged their families to emigrate there. Perhaps more such letters were sent by Christopher Reichardt and Anna Katherina Penzel Reichardt after this married couple settled in the county. The arrival of the families from Asch in Pulaski County increased the number of German-speaking immigrants in the county by nearly twenty percent, and the new arrivals were important additions to the community not only because they were educated and had some wealth, but also because the family members included eight young unmarried females and eight bachelors. Such unmarried women were welcome in a place that had a sizable number of single men in its small German/Austrian-born population.20 Also the unmarried men from Asch, once they established themselves, were attractive to the daughters in families that had emigrated earlier to the area. The 1850s were a time for the new emigrants from Asch to adapt to their new country. The first arrivals, John C. Geyer and John A. Reichardt, remained in Pulaski County for only a short time. As mentioned, Geyer bought a long stretch of riverfront land in Conway County and started farming there. After a few years in the county, Reichardt married Anna Margareta Spindler and moved with her to Boonville, Missouri. Christopher and Anna Katherina Reichardt took up farming on land near Granite Mountain Springs, a few miles due south of Little Rock. They eventually settled on a farm near the Primrose Cemetery, living close to several other German-speaking immigrants.21 When Christopher’s parents, Johann Martin and Eva Katherine Reichardt, arrived in 1854, they bought a farm near their son and daughter-in-law, and lived there with their three daughters and son. In 1856, Christopher claimed a 43-acre homestead in the Primrose area, then he added acreage to it in 1859 (44.0 acres) and 1861 (38.2 acres) by purchasing land cheaply from the federal government.22 When Eva Katherine -- Christopher’s mother and Johann Martin’s wife – passed away on July 26, 1858, she was buried in the Primrose cemetery near her home. Although the exact year of their arrival in Pulaski County is not known, Johann Christof and Marie Elizabeth Penzel made a home sometime in the 1850s in the Primrose area near their daughter Anna Christina Penzel Reichardt.23 Upon John Christof’s death in 1857, he was buried at the Primrose cemetery and Marie Elizabeth, the 1860 census showed, moved in with her daughter’s family. Isaac and George Geyer also settled on farms near Granite Mountain, but not by the Primrose cemetery. 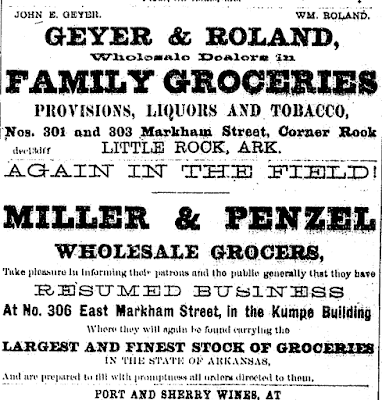 Their farms were within a couple of miles of the Christopher and John M. Reichardt farms and were in the same township (Union Township). Papa Geyer and his family did not locate in the Primrose community or in Union Township. Instead, he acquired a farm in Big Rock Township, a few miles north of Granite Mountain and further to the west of the city. He and his family lived there until the start of the Civil War. Johann Michael and Maria Sophie Geyer, after reaching Pulaski County in 1852, made their home in Little Rock where their son John Erhardt and daughter Sophia had settled. 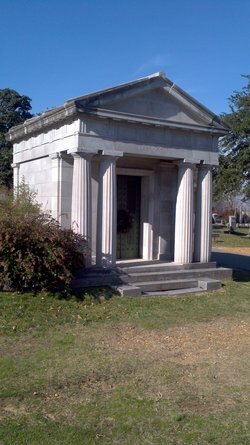 Johann Michael was the first of the Asch immigrants to pass away, dying on November 20, 1856, and was buried in Little Rock’s Mt. Holly cemetery. After he died, his wife Maria Sophie moved in with the family of her daughter Sophia, who had married Joseph C. Schader in 1853. George Reichardt, who had been a classmate of John E. Geyer back in Asch, also lived in Little Rock when he was not driving cattle from Texas to sell in California. Later In his life, he told stories of how he had made a big profit with his first cattle drive when beef was scarce in California, but had lost money on his last drive because by that time the state had plenty of local beef.25 When not driving cattle, he worked as a merchant in Little Rock and lived in a boarding house there. 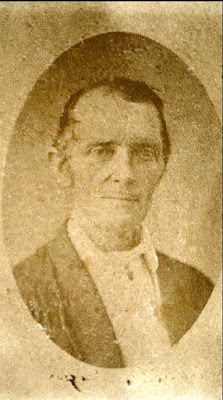 In 1856, Isaac Geyer married Kisirah Nail, who had been born in Alabama. 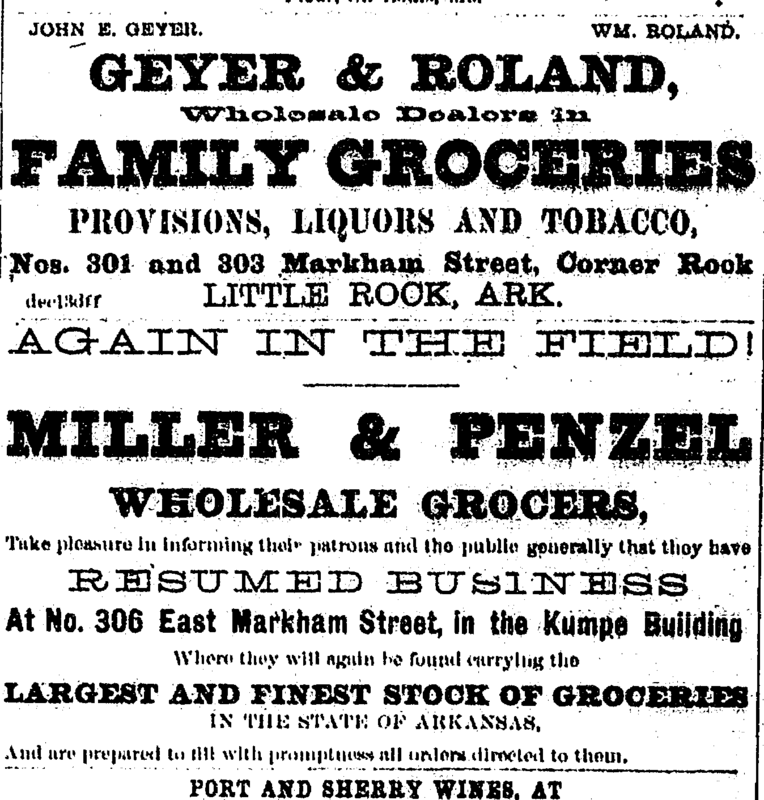 They lived on Geyer’s farm in Union Township. In 1857, six members of the families from Asch got married. They included George Geyer, who married Kasey (family name unknown) and John Christopher Geyer, who, living on his farm in Conway County, married Nancy Adeline (family name unknown). Both Kasey and Nancy Adeline had been born in the United States. Both families continued to live on their farms. March 30: John Erhardt Geyer married Helene Marie Eliza Struve, born in 1835, who had emigrated in about 1847 from Hanover with an older sister, Amelia (1829 – 1858), and an older brother, August (1831 – 1876). They had settled in Little Rock where her brother had become a merchant. As 1860 -- the last full year before the start of the Civil War -- ended, the families from Asch had made progress in adapting to their new home. They had bought farms or found jobs. started families and businesses and established themselves as solid citizens. Likely they missed some aspects of their lives in Asch: Pulaski County had no Lutheran Church for them to attend and lacked the social clubs and organizations that had been available in their previous home. Also some of them who lived on farms were isolated from the larger population because they did not speak English.32 Nevertheless, the Asch immigrants had planted promising roots in their new homeland, and those who had married had added at least fifteen babies to the community of Asch emigrants. When the Civil War arrived in 1861, the families from Asch were not united in their loyalties. Two of the immigrants joined Union forces and three of them, plus the husbands of two women from Asch, volunteered – at least briefly -- for the Confederate Army, even though no members of any of the Asch families, nor of the new families created by marriage, owned slaves. Most Asch emigrants managed to avoid serving in either army. Kramer, the husband of Adelina, had joined Little Rock’s militia, the Capitol Guards in 1860 after he left the U.S. Army to start a grocery store. 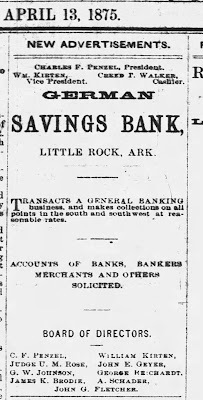 When the war started In 1861, he resigned from the Guards just before the unit was incorporated into the Confederate Army as Company A of the Sixth Arkansas Infantry Regiment.36 However, in an advertisement published in the Arkansas Gazette in May, 1861, after the war had started, he and his business partner, Ferdinand Sarasin, announced they would be selling all of their goods so they could close their grocery store and join the Southern army.37 Although Kramer never became a rebel soldier, he professed support for the Southern cause. Papa Geyer’s family had little involvement in the Civil War. His son, John Christian, born in 1845, was too young for military service when the war started, and stayed out of service as he grew older. The spouse of his daughter Ernestine, Francis Ditter, the former U.S. Army soldier, was over 40 years old when the war started and did not join an army. His other son-in-law, Ferdinand Baer, was 34 years old when the war started. Like Kramer and Sarasin, he had been in the Capitol Guards, but had left it before it became part of the Confederate Army. Nevertheless, he served briefly in the Confederate Army: The main evidence of his service is a claim submitted by Anna Margareta, his widow, in 1928 for a confederate army pension. Also, documents show “F. Baer” and “Ferdinand Joseph Baer” was a soldier in Company A of the 13th Infantry Regiment of the Arkansas Militia, but list no dates of service.38 Baer’s obituary did not mention any service in the Civil War. Nine months after the Battle of Murfreesboro, Penzel suffered a traumatic wound at Chickamauga, on September 20, 1863, that “came near ending his existence.” As described in his obituary, “He was struck in the mouth with a large ball, which passed through his head, coming out at the base of the skull.”45 According to the story told by his great grandson, the poet Charles Penzel Wright, Jr., the bullet entered his mouth as he yelled “charge.”46 The wounded Penzel was captured and stayed in captivity until the end of the war. Soon after he arrived back in Little Rock, he signed, on June 24, 1865, a loyalty oath.47 He was ready to move on in his life. As the Civil War was ending, it would have been reasonable for the families from Asch to have second thoughts about their decisions to leave their homes in Asch to settle in the new world. The war had brought them hardships and divisions. It had placed their family members in opposing armies. It had disrupted their hopes for better lives for themselves and their children. Fortunately for them, although they did not know it at the time, their luck had already begun to change. 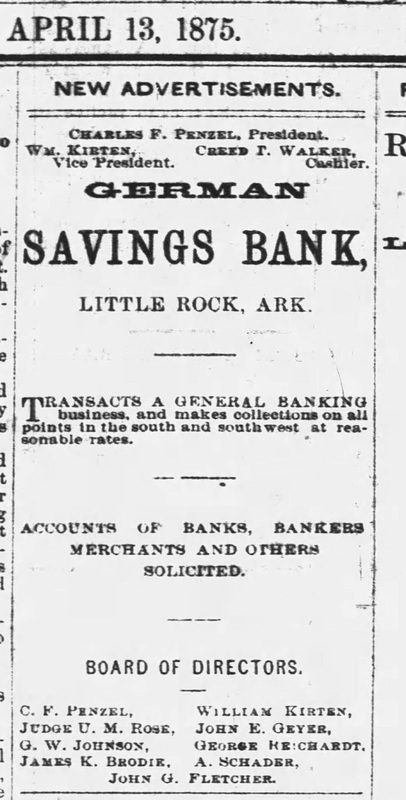 As Little Rock prospered in the years following the war, the families from Asch would find great success as merchants in the city. 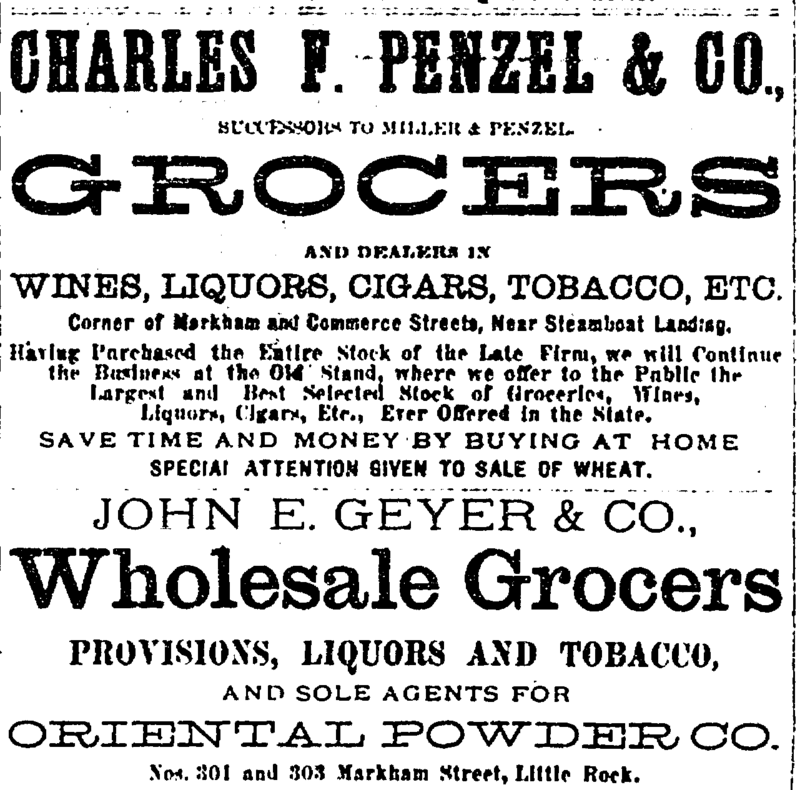 The first and biggest step toward future accomplishments was the opening of a grocery store on Little Rock’s Main Street in November 1863, a couple of months after the city had been occupied by Federal troops. 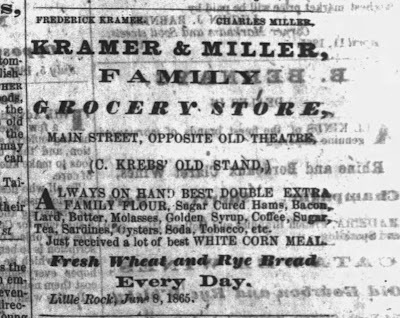 The store’s name was the Kramer & Miller Family Grocery Store and Bakery, and it would enrich several of the Asch families and prepare others to open their own successful stores. From this foundation, the Asch families would become leaders of the protestant German community in Little Rock and would make important contributions to the economic, religious, and social life of the city in the decades following the Civil War. 1. In the 1850s, Asch was a city and district on the western edge of Bohemia, a region in the Austrian-Hungarian empire. Then, as now, the city was located near the north end of a narrow peninsula – a finger-shaped protuberance – that extends into Germany. To its north, west, and east, the city was and is located just a few miles from German borders. In a census conducted in 1858, the population of the city of Asch was 7,420. The larger district of Asch that included the city and surrounding area, had a population of 23,589 (source: http://www.asch-boehmen.de/d/index.php?seite=1_1 ). Most of the city and district residents spoke German and had German ancestry. A 1921 census found that ninety-nine percent of Asch’s population was considered to be “German” (Statistický lexikon obcí v Čechách (Statistical handbook of the municipalities in Bohemia), part of the Statistický lexikon obcí v Republice Československé (Statistical handbook of the municipalities in the Czechoslovak Republic), 2nd ed., vol. 1 (Prague, 1924). See https://en.wikipedia.org/wiki/A%C5%A1 . 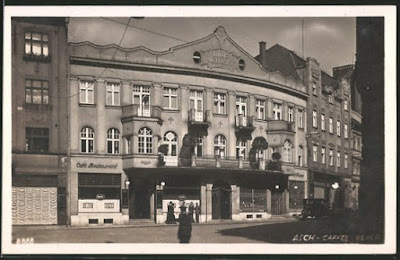 After World War I, Asch became part of Czechoslovakia. The spelling of the city name was de-Germanized, changed to “Aš.” In the 1930s after Hitler seized power, German nationalists wanted “Sudetenland” -- areas in Czechoslovakia, like Aš, in which most residents were ethnic Germans – to be brought into Germany, and in 1938 Germany’s Nazi regime forcibly annexed Sudetenland into the Third Reich. After the end of World War II, the new government in Czechoslovakia forced almost all ethnic Germans living in the Sudetenland to leave the country. The population of Aš.changed from 22,930 in 1930 to 11, 378 in 1947. The city’s population in 2016 was 13,227. 2. These emigrants from Asch had, mainly, traditional German names with German spelling. After they came to the United States, most altered their names to conform with English usage. For example, Johann became John, Christof became Christopher, and Edvard became Edward. With few exceptions, I use the Americanized names of the emigrants. Among the exceptions are the first names of the parents of the families who came to the United States with their children. Thus, I refer to Johann Martin Reichardt and Johann Michael Geyer, but substitute John for Johann when referring to their various sons. The spelling of some names change from source to source. The main problem is the interchanging of “a” and “e.” For example, the name of one Reichardt daughter is sometimes spelled “Adaline” and sometime “Adelina.” Similar differences in spelling can be found with the names of Margaretha, Catherina (Katherina), and Sophia, with “a’s” and “e’s” changing. In other places, the “K” is changed to “C” (e.g., Carl instead of Karl) and “pf” changed to “f” (Christoph to Christof). In 1848, Carl Schurz took an active part in the revolution in Germany…. With him in the revolutionary movement was John Adam Reichardt who later came to this country with Schurz. Mr. Reichardt came to what is now the city of Little Rock, while Schurz went to Wisconsin, and later made his home in Watertown, Wisc. Schurz, fleeing arrest following the collapse of the 1848-49 uprising, first went to Paris and then to London before emigrating to the U.S. in August 1852. John Adam had already been in Arkansas for a couple of years by the time Schurz arrived in Wisconsin. “Carl Schurz Day to be Observed.” Arkansas Gazette, March 3, 1929, p. 45. 5. All the information on the ship journeys of the Asch families from Bremen to New Orleans was found through searches of the following Ancestry.com data base: New Orleans, Passenger Lists, 1813-1963 [database on-line]. Provo, UT, USA: Ancestry.com Operations, Inc., 2006. 6. According to a newspaper article published in 1939, Johann M. Reichardt had owned a “woolen mill” in Asch, a textile manufacturing center. The article says he sold the mill “in order that he might come of the United States.” See Lucy Marion Reaves. “Glimpse of Yesterday.” Arkansas Gazette, December 10, 1939, p. 23. On the passenger list of the Johannes, his occupation was listed as “Oeconom,” which probably means economist. 7. John Christopher Geyer “commanded a military organization in the  revolution and was compelled to flee to the US,” according to Fay Hempstead. 1911. Historical Review of Arkansas, vol. 2. Lewis Publishing co. p. 753. (Available at https://books.google.com/books?id=Sz9EAQAAMAAJ ) His role in the 1848 revolution (“he led a company of revolutionists”) was mentioned in the obituary of his younger brother, John E. Geyer. See “Pioneer Merchant of the City Succumbs.” Arkansas Gazette, Dec. 29, 1919, p. 2. The 1860 census showed Geyer living in Welborn Township in Conway County; in 1870 his home was in nearby Howard Township. In 1875, he was appointed postmaster of Plummers Station, a stage coach and train stop in Howard Township. In 1880, Plummer Station was incorporated as Plumerville. In considering the accuracy of this story, note that Asch was in Austria, not Germany; John A. Reichardt was likely the first in his family to travel to the United States, arriving in 1848 or 1849; and ship records show that Anna Catherine and Christopher sailed to the United States in 1850 and the father and mother of Catherine Penzel were not listed as passengers on the ship (see footnote 4). 12. 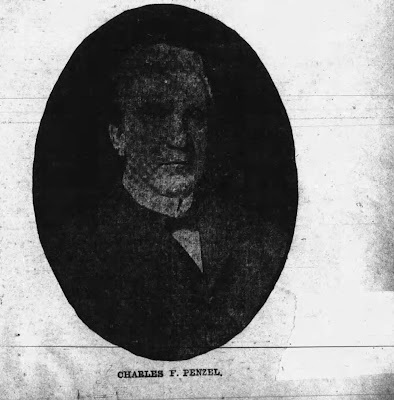 Charles Penzel Wright, Jr., the great-grandson of Charles F. Penzel, referred to his great grandfather as “minor nobility” in an interview published in The Paris Review in 1989. Wright achieved renown as a poet, serving as U.S. poet laureate in 2014-2015 and winning the Pulitzer Prize for poetry in 1998. See J.D. McClatchy (interviewer). “Charles Wright. 1989. The Art of Poetry No. 41.” The Paris Review, issue 113, Winter. (accessed on-line). 13. More emigrants from Asch made the journey to Little Rock, but my research has not discovered their fates. Six such emigrants were on the Columbia with George Reichardt and Wolfgang Wunderlich in 1852. They were Johann Precht, age 20, a weaver from Asch, and Adam and Margaretha Heilman, both age 40, who were traveling with two small children from Rossbach (now Hranice), a small city a few miles north of Asch. On the ship’s list of passengers, Precht and the Heilmans specified Little Rock as their travel destination. Other travelers from Asch heading to Little Rock were Christine Jäger, age 28, who traveled with the Johann M. and Sophia Geyer family on their 1852 transatlantic trip. Also on board the ship was John Wolfbrell, age 20, from Asch. In the ship’s records, he listed Arkansas as his destination. On the 1854 ocean journey of the Reichardt family, Maria Pfeiffer, age 20, from Asch, was listed as traveling with them to Arkansas. 14. Adam Penzel departed on March 19, 1879 from Hamburg traveling to New York on the Silesia. See Ancestry.com. New Orleans, Passenger Lists, 1813-1963 [database on-line]. Provo, UT, USA: Ancestry.com Operations, Inc., 2006. 15. 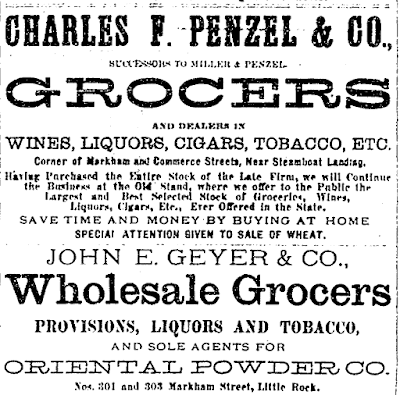 Adam Penzel apparently was not closely related to Charles Penzel, whose obituary in 1906 did not mention Adam, who was by that time a successful and well-known Little Rock butcher, as a relative. Also, Adam was not a pall bearer at Charles Penzel’s funeral. 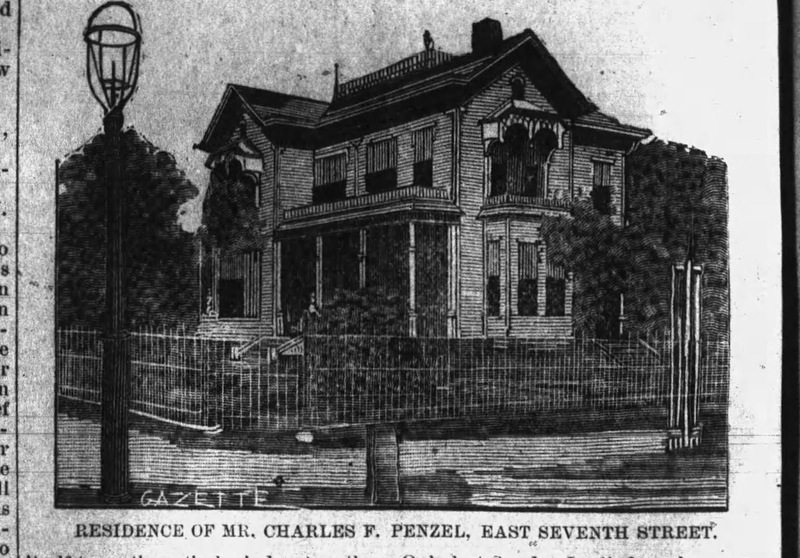 Adam Penzel did name his first son “Charles.” See “Last Rites for Charles Penzel.” Arkansas Democrat, February 20, 1906, p. 8. 16. Several connections by marriage among the Geyer, Wunderlich, Kuenzel, and Penzel families can be found when exploring genealogy websites. However, Reichardt was an uncommon last name in Asch, suggesting that Johann Martin was born elsewhere and had moved to Asch from Germany. 17. Estimates of the number of 48ers who emigrated to the United States range from 2,000 to 10,000. Either of those numbers is small compared to the estimated 200,000 Germans who emigrated contemporaneously to the United States from 1848 to 1850. Despite the relatively small number of 48ers who came to the U.S., they had a tremendous impact on the nation as politicians, writers, newspaper editors, and opinion leaders, and through their participation in the Union Army during the Civil War. See the following books: Carl Wittke. 1952. Refugees of Revolution: The German Forty-Eighters in America. University of Pennsylvania Press and Don Heinrich Tolzmann. 1998. The German-American Forty-Eighters, 1848-1998. Indiana German Heritage Society. 18. Jonathan J. Wolfe. 1973. “The Peopling of Pulaski: Pulaski County Population Sources and Composition 1830-60.” Pulaski County Historical Review, 21, pp. 51-52. Shirley Sticht Schuette. 2005. Strangers to the Land: The German Presence in Nineteenth Century Arkansas, A Thesis submitted to the Graduate School University of Arkansas at Little Rock in partial fulfillment of requirements for the degree of Master of Arts in Public History, pp. 35-38. 19. Several other emigrates (e.g., Frederick Kramer) came to United States in 1848 and 1849, but they were not refugees fleeing Europe in the aftermath of the Revolution. Of course the political and economic conditions that led to the 1848 Revolution were also factors that led to increasing emigration from German and Austrian states. 20. The 1860 census showed that 63 single men born in Germany or Austria were living in Pulaski County. 22. Information on the land granted and sold to Christopher Reichardt is found in a search of this Ancestry.com data base: United States, Bureau of Land Management. Arkansas, Homestead and Cash Entry Patents, Pre-1908 [database on-line]. Provo, UT, USA: Ancestry.com, 1997. For more on Louis George and his family, who had come to Little Rock in 1833 as part of the Mainzer Emigration Society, see Dan Durning. 1975. “Those Enterprising Georges: Early German Settlers in Little Rock.” Pulaski County Historical Review, 32(2), June, pp. 21-37. 25. “Geo. Reichardt, Old Citizen, Dead.” Arkansas Gazette, June 15, 1910, p. 7; “George Reichardt was one of the leading business men of Little Rock.” Arkansas Gazette, Nov. 7, 1931, p. 56; and “George Reichardt (obituary).” Arkansas Staatszeitung, June 17, 1910. 26. Wunderlich enlisted on May 21, 1856. Ancestry.com. U.S. Army, Register of Enlistments, 1798-1914 [database on-line]. Provo, UT, USA: Ancestry.com Operations Inc, 2007. 27. See “Married.” Weekly Arkansas Gazette, Nov 11, 1853, p. 3 and “Jos. C Schader. Pioneer Resident Passed Away Yesterday.” Arkansas Democrat, Nov. 14, 1902 p. 2. Also see “Mrs. Sophia Schader (obituary).” Arkansas Democrat, January 3, 1916, p.6. 28. Ferdinand Baer Sr. (obit). 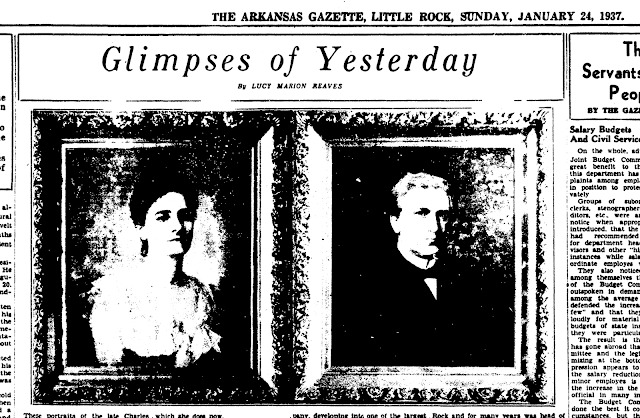 Arkansas Democrat, February 15, 1912, p. 10. 30. The last three of these four 1857 weddings were conducted by Washington L. Lewis, a Pulaski County Justice of the Peace. After their marriages, Louisa and her sister Adelina lived with their husbands in the Little Rock Arsenal barracks until October 1859 when Kramer was allowed to leave the army before the expiration of his five-year term. The Wunderlich family stayed in the barracks until his release from service, effective February 1, 1861, just a week before the commander of the Little Rock Arsenal surrendered it to avoid an attack by an enraged mob. See David Sesser. 2013. The Little Rock Arsenal Crisis, The History Press. 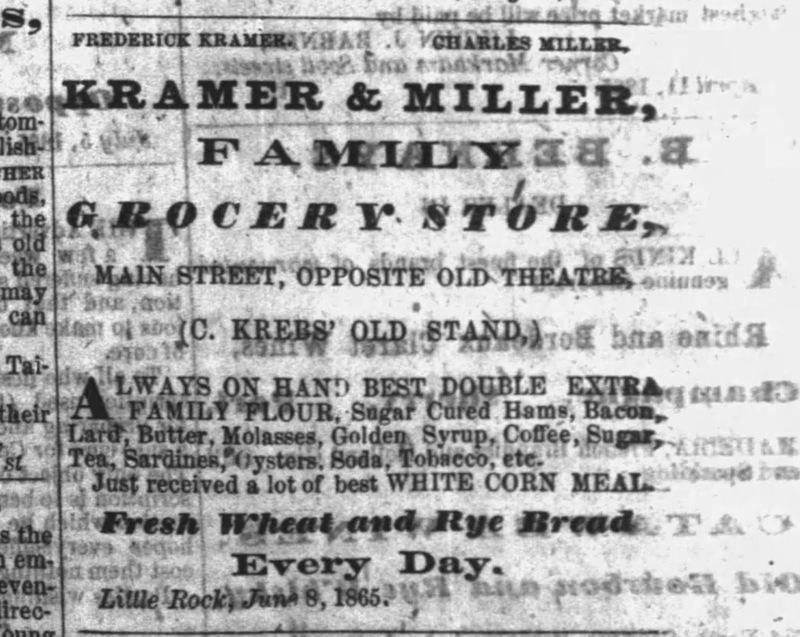 When Kramer left the army, he and Adelina moved to a living space above the grocery store he had opened on Main Street in November 1859 with his friend Ferdinand Sarasin, a German immigrant. 31. Note that Kramer had taken the same duties as a carriage maker at the Arsenal that Ditter had had previously. In early 1857, when Kramer had moved to Little Rock as his first term as a soldier was ending, he had applied for U.S. citizenship. Ditter was one of men who signed his application, attesting to Kramer’s good character. Four of the men who married women from Asch had in common their work as carriage makers and carpenters. Ditter, Kramer, and Wunderlich served as carriage makers at the arsenal, and Ditter, Baer, and Wunderlich made and sold carriages, coffins, and other wooden products. 32. When the 1860 census was taken, the report noted that the members of the Christopher and Johann Martin Reichardt households could not read or write English. However, the lack of English skills was not a big problem for them. Most of their nearby neighbors had also immigrated from Germany or Austria, so it was possible to socialize with them in German. Also, when they needed supplies or other goods, they could get them at Little Rock stores that were owned and operated by German immigrants. 33. Information on John Adam Reichardt’s service was mentioned in testimony he gave on behalf of Issac Bott, a German immigrant living in Little Rock, who had filed a claim in hopes of getting paid for a load of sugar that Federal troops had taken from him in September 1863. See Ancestry.com. U.S. Southern Claims Commission, Disallowed and Barred Claims, 1871-1880 [database on-line]. Provo, UT, USA: Ancestry.com Operations Inc, 2007. 34. National Park Service. U.S. Civil War Soldiers, 1861-1865 [database on-line]. Provo, UT, USA: Ancestry.com Operations Inc., 2007. 35. One of Christopher and Johann Martin’s neighbors, George Blank, listed in the 1860 census as being from Austria, lost one of his sons, George, who was killed while serving in the Union Army in 1865. He is buried in the Little Rock National Cemetery. 36. See Calvin L. Collier. 1961. First In – Last Out: The Capital Guards. Pioneer Press (Little Rock). 38. “F. Baer” appears in a search of records in National Park Service. U.S. Civil War Soldiers, 1861-1865 [database on-line]. Provo, UT, USA: Ancestry.com Operations Inc., 2007. According to a history of the Capitol Guard, “F. Bear” was a member of the Guard who left just before it was incorporated into the Confederate Army. Another soldier, this one named George Baer, was in Company A of the Arkansas Sixth Regiment (the former Capitol Guard). He was killed in action on June 27, 1864 at the battle of Kennesaw Mountain in Georgia. 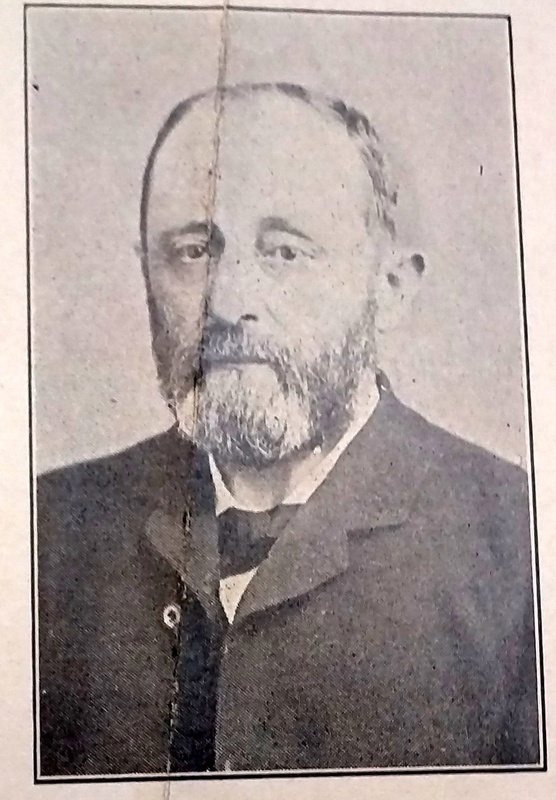 His relation to Ferdinand Baer, if any, is not known. Collier, First In – Last Out, p. 115. “Funeral of Pioneer Business Man Tuesday.” Arkansas Democrat, December. 29, 1919, p.1. Also see Fay Hempstead. 1911. Historical Review of Arkansas, vol. 2. Lewis Publishing co. p. 753-754 (Available at https://books.google.com/books?id=Sz9EAQAAMAAJ ). 40. “Jos. C Schader. Pioneer Resident Passed Away Yesterday.” Arkansas Democrat, Nov. 14, 1902 p. 2. 42. “Chas. 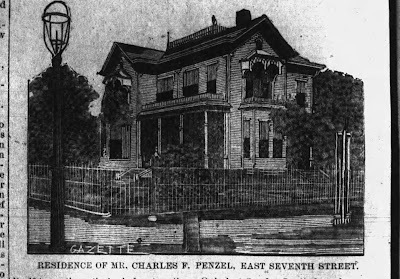 F Penzel Passed Away This Morning.” Arkansas Democrat, Feb. 17, 1906, p. 1 and “Charles F. Penzel Died Suddenly.” Arkansas Gazette, Feb. 17, 1906, p. 1. 43. Henry Fisher (Fischer) was born in 1818 in Altenburg, Saxony. He emigrated to Arkansas in 1837 and married Anna Catherina George on Feb. 14, 1839. She was a member of the George family (Loui George's sister) that had emigrated to Little Rock in 1833. Henry and Catherina named their first son, born in 1840, Henry. Henry Fisher Sr. died on June 13, 1868 leaving a large family behind. “Died.” Daily Arkansas Gazette, June 16, 1868, p. 3. 44. This draft letter was written in Penzel’s own hand in his Wanderbuch, which he must have carried with him when he was a soldier. Remarkably it was written in English even though German was the native language of both him and Henry Sr. According to a history of the Capitol Guards, Henry Miller was “killed on his feet” in fierce fighting early on December 31, 1862 during the battle of Murfreesboro (also known as the Battle of Stones River). During the same day of fighting, Peter Hotze, another German immigrant from Little Rock, was wounded when he was “blown off his feet” by an artillery shell and Capt. John Fletcher, who was commanding Company A, was shot in both legs. Calvin L. Collier. 1961. First In – Last Out: The Capital Guards, Pioneer Press (Little Rock), pp. 60 – 65. 45. Chas. F Penzel Passed Away This Morning. Arkansas Democrat, Feb. 17, 1906, p. 1. 46. See J.D. McClatchy (interviewer). “Charles Wright. 1989. The Art of Poetry No. 41.” The Paris Review, issue 113, Winter. (accessed on-line). 47. The naturalization papers are in the following collection: Penzel, Charles F. papers, Arkansas State Archives, Little Rock, Arkansas.